Hello Friends, we are here with Railway RRB ALP 09 August 2018 Analysis and Question Asked in Exam Download (All Shifts), You can check All Details of RRB ALP 2018 Questions asked in the Railway Exam 2018. Below is the complete Analytics of 09-08-2018 Question Paper and Exam pattern. By checking this pattern you can assume rest of the question paper will be of same pattern or almost same pattern. The Preliminary or First stage of Railways Recruitment Board RRBs exam, Railways RRB ALP exam 2018, started today. The exam will span across - 9th, 10th, 13th, 14th, 17, 21, 29, 30, 31 August 2018. Owing to the huge number of applicants appearing for RRB ALP 2018 Popular Category 2018, the exam will take place in 3 shifts (9:00 AM, 12:00 PM & 4:00 PM) each day. 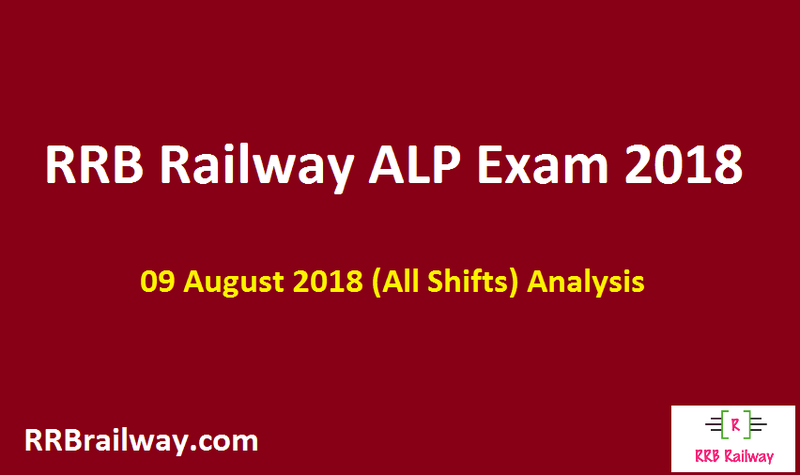 This article will give you the detailed Railways RRB ALP 2018 Prelims Analysis of 9th August 2018, for all the shifts that will take place today. Good Attempt for each shift. First of all, let us take a look at the Good Attempts in the RRB RRB ALP exam 2018 Analysis 9th August 2018.
Who is the current CM of Tamilnadu?How many Sattelite are there in Jupiter? 2 questions were asked from SI Unit. Rate of change in momentum is known as?